I'm babysitting my grand daughter this week. Her parents are out of town, and my grandson has gone to his other grandmother's house for the week...a divide and conquer sort of operation. I know my limitations and one 17 month old is about it for the week. It's good therapy. This is the happiest little person I've ever met. Our days are spent laughing and playing. There are Cheerios spread far and wide, toys strewn all over, and I expect to be finding pieces of graham crackers for months. It's a good lesson in letting go and enjoying the moments that are passing all too quickly. 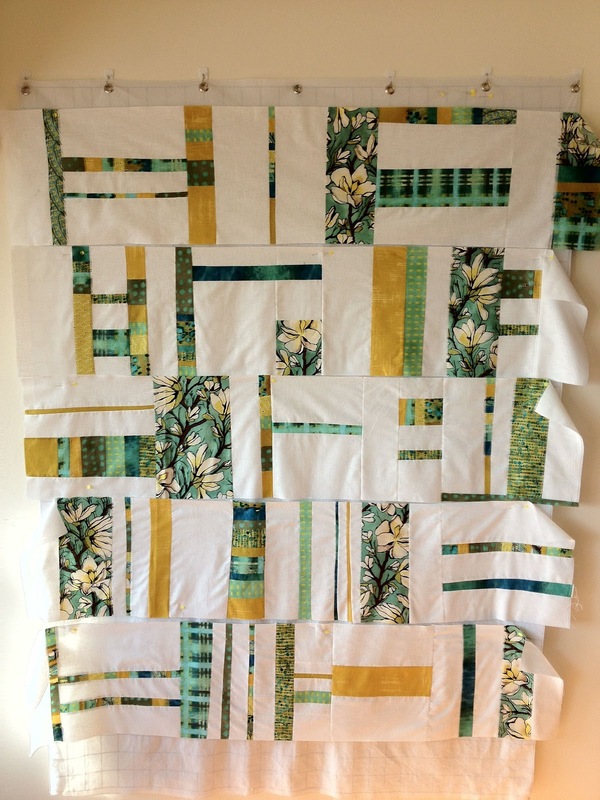 Last weekend I was able to get this next quilt laid out and put into strips. It started when I fell in love with the magnolia fabric (a Laura Gunn design) and kept adding to the collection over time. Having the design wall has given me a chance to do something other than the more conventional piecing I've done. Inspired by the more "modern" quilting designs I see on line, I came up with this. Well, I'm sure I'll like it, once it's finished, but let me say here it did not fulfill my need for lots of color and I was bored to tears after the first row. I think I have two more big batches of "matchy-matchy" fabrics to use up, and then I'll probably avoid these again, at least until I get bored with the other stuff. As in all aspects of my work, I'm much happier working with the challenge of putting together scraps. Good grief! I just checked the calendar and realize I'll be heading back to NM in just a little over two weeks. We're finally letting go of the retail space where the yarn shop was once located, and it means a landslide of yarn, fibers, and equipment will be on my doorstep soon. I have an enormous rug loom for sale if you know anyone who is interested...it's the "Rio Grande" style (aka Spanish walking loom). It's super for rugs or low warp tapestry, and is a work of art in its own rite. I'd post a photo if I had one...it's currently buried under skeins of yarn in the shop. And now...back to Sesame Street. I just saw a skit called "Desperate Houseplants" and have decided this is probably a show I should watch instead of what I usually watch...and maybe I'd learn something in the bargain. 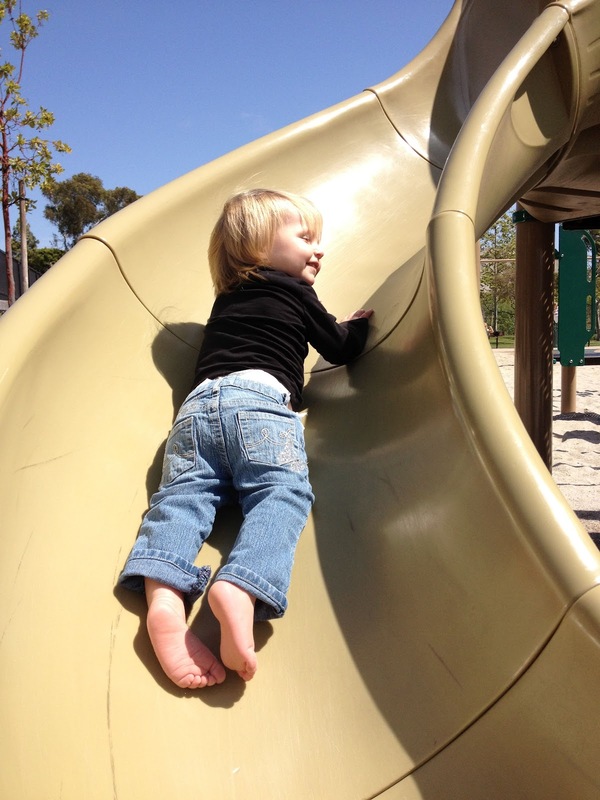 It sure sounds like a fun week to spend with a cheery little one. They sure can brighten your day. Hi, Martie -- the quilt is beautiful and has a very Southern California beach cottage look to it -- I'm seeing sand, white Adirondack chairs, the sun and the ocean. You will be reminded of Encinitas every time you look at it. Thanks for sharing your quilting adventures. I love seeing all the colors and combinations. Oh, the possibilities . . . Enjoy the rest of your time in California! Enjoy your time. clean up can happen anytime after he's gone home. That's how we do it here. How fun! My niece Violet loves to spend time with her Mimi when she is in town visiting. Grandparents are very special! 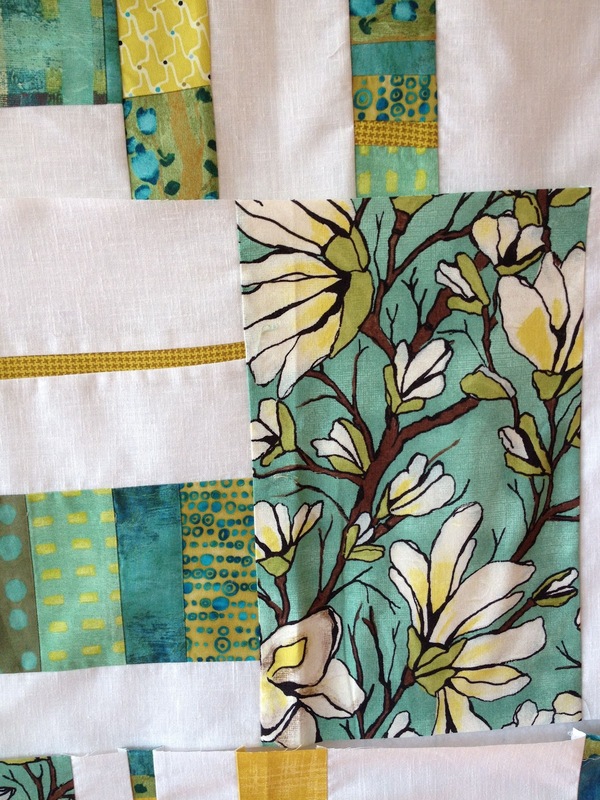 I love the quilt, it is coming together beautifully. 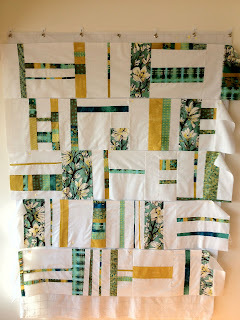 I don't know if I would have enough patience to make a quilt but it is my mission one of these days!